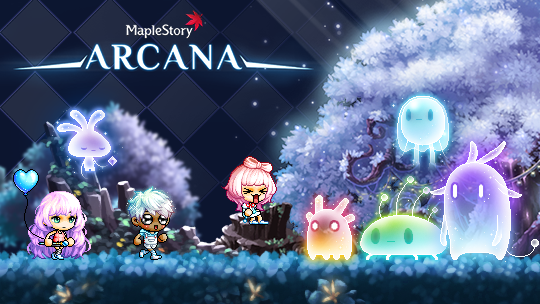 MapleStory added a new region Arcana to continent of Arcane River! A once beautiful forest of light that has been corrupted by darkness is available to level 225 players who have defeated Lucid and completed the Decisive Battle quest in Lachelein. Then ride the flying fish and travel downriver to Arcana. What you need to do is helping the small spirits of the forest defeat the Corrupted Spirit of Harmony to save their Spirit Tree. Make friends with the little spirits and be rewarded. A dark aura has come over the Spirit Tree and spread across the land, bringing with it wild spirits including Sun Spirits, Water Spirits, and Thunder Cloud Spirits. "Spirits throughout the forest are becoming corrupted and twisted to represent grief, despair, and chaos. Help the small spirits as they try to save their forest by defeating the powerful creature, the Corrupted Spirit of Harmony. This monster is recommended for players Lv. 240 and above." You will be rewarded with additional Arcane Symbol slots and the Arcane Symbol: Arcana after conquering the darkness.